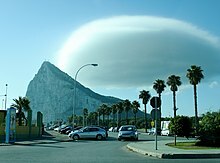 The sovereignty of Gibraltar is a point of contention in Anglo-Spanish relations because Spain asserts a claim to the territory. 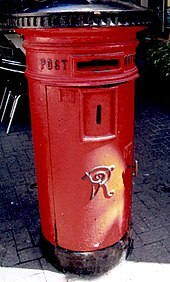 Gibraltarians rejected proposals for Spanish sovereignty in a 1967 referendum and, in a 2002 referendum, the idea of shared sovereignty was also rejected. In 1160 the Almohad Sultan Abd al-Mu'min ordered that a permanent settlement, including a castle, be built. It received the name of Medinat al-Fath (City of the Victory). 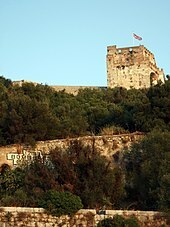 The Tower of Homage of the Moorish Castle remains standing today. After the conquest, Henry IV of Castile assumed the additional title of King of Gibraltar, establishing it as part of the comarca of the Campo Llano de Gibraltar. Six years later, Gibraltar was restored to the Duke of Medina Sidonia, who sold it in 1474 to a group of 4350 conversos (Christian converts from Judaism) from Cordova and Seville and in exchange for maintaining the garrison of the town for two years, after which time they were expelled, returning to their home towns or moving on to other parts of Spain. In 1501 Gibraltar passed back to the Spanish Crown, and Isabella I of Castile issued a Royal Warrant granting Gibraltar the coat of arms that it still uses. In 1704, during the War of the Spanish Succession, a combined Anglo- Dutch fleet, representing the Grand Alliance, captured the town of Gibraltar on behalf of the Archduke Charles of Austria in his campaign to become King of Spain. Subsequently most of the population left the town with many settling nearby. As the Alliance's campaign faltered, the 1713 Treaty of Utrecht was negotiated, which ceded control of Gibraltar to Britain to secure Britain's withdrawal from the war. Unsuccessful attempts by Spanish monarchs to regain Gibraltar were made with the siege of 1727 and again with the Great Siege of Gibraltar (1779 to 1783), during the American War of Independence. In the 1950s, Franco renewed Spain's claim to sovereignty over Gibraltar and restricted movement between Gibraltar and Spain. 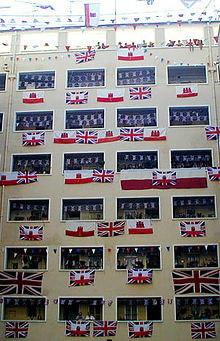 Gibraltarians voted overwhelmingly to remain under British sovereignty in the Gibraltar sovereignty referendum, 1967, which led to the passing of the Gibraltar Constitution Order in 1969. In response, Spain completely closed the border with Gibraltar and severed all communication links. The border with Spain was partially reopened in 1982 and fully reopened in 1985 before Spain's accession to the European Community. 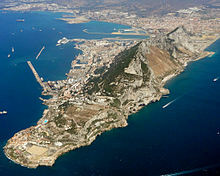 Gibraltar's terrain consists of the 426-metre-high (1,398 ft) Rock of Gibraltar  made of Jurassic limestone, and the narrow coastal lowland surrounding it. It contains many tunnelled roads, most of which are still operated by the military and closed to the general public. Over 500 different species of flowering plants grow on the Rock. Gibraltar is the only place in Europe where the Gibraltar candytuft ( Iberis gibraltarica) is found growing in the wild; the plant is otherwise native to North Africa. 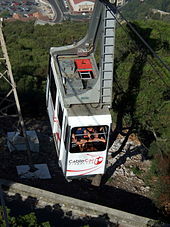 It is the symbol of the Upper Rock nature reserve. Olive and pine trees are among the most common of those growing around the Rock. 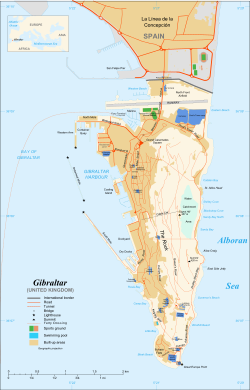 Gibraltar is one of the most densely populated territories in the world, with a usually-resident population in 2012 of 32,194  equivalent to approximately 4,959 inhabitants per square kilometre (12,840/sq mi). The growing demand for space is being increasingly met by land reclamation; reclaimed land currently comprises approximately one tenth of the territory's total area. 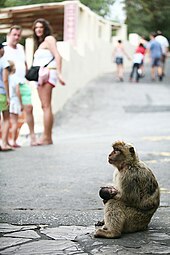 Gibraltarians often converse in Llanito (pronounced [ʎaˈnito]),  a vernacular unique to Gibraltar. It is based on Andalusian Spanish with a strong mixture of British English and elements from languages such as Maltese, Portuguese, Genoese Italian and Haketia (a Judaeo-Spanish dialect). Llanito also often involves code-switching to English and Spanish. According to the 2012 census, approximately 72.1% of Gibraltarians are Roman Catholics. The 16th century Saint Mary the Crowned is the cathedral church of the Roman Catholic Diocese of Gibraltar, and also the oldest Catholic church in the territory. Other Christian denominations include the Church of England (7.7%), whose Cathedral of the Holy Trinity is the cathedral of the Anglican Bishop of Gibraltar in Europe; the Gibraltar Methodist Church,  Church of Scotland, various Pentecostal and independent churches mostly influenced by the House Church and Charismatic movements, as well as a Plymouth Brethren congregation. Several of these congregations are represented by the Gibraltar Evangelical Alliance. The third religion in size is Islam (3.6% of the population). There is also an established Hindu population (2%), members of the Bahá'í Faith and a long-established Jewish community, which, at 763 persons, accounts for 2.4% of the population. As a share of the total population, this is the second-largest Jewish population in the world, trailing only Israel. There are four functioning Orthodox synagogues in Gibraltar and several kosher establishments. The Gibraltar Broadcasting Corporation operates a television and radio station on UHF, VHF and medium-wave. The radio service is also internet-streamed. Special events and the daily news bulletin are streamed in video. The other local radio service is operated by the British Forces Broadcasting Service which also provides a limited cable television network to HM Forces. 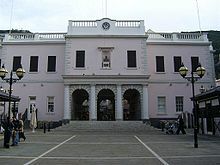 The largest and most frequently published newspaper is the Gibraltar Chronicle, Gibraltar's oldest established daily newspaper and the world's second oldest English language newspaper to have been in print continuously  with daily editions six days a week. Panorama is published on weekdays, and 7 Days, The New People, and Gibsport are weekly. Native Gibraltarians have produced some literature of note. The first in fiction was probably Héctor Licudi's 1929 novel Barbarita, written in Spanish,  chronicling the largely autobiographical adventures of a young Gibraltarian man. Throughout the 1940s and 1950s, several anthologies of poetry were published by Leopoldo Sanguinetti, Albert Joseph Patron and Alberto Pizzarello. The 1960s were largely dominated by the theatrical works of Elio Cruz and his two highly acclaimed Spanish language plays La Lola se va pá Londre and Connie con cama camera en el comedor. [ citation needed] In the 1990s, the Gibraltarian man-of-letters Mario Arroyo published Profiles (1994), a series of bilingual meditations on love, loneliness and death. Trino Cruz is a bilingual poet originally writing English but now mainly in Spanish, who also translates Maghreb poetry. Of late there have been works by the essayist Mary Chiappe, such as her volume of essays Cabbages and Kings (2006) and by M. G. Sanchez, author of the books Rock Black: Ten Gibraltarian Stories (2008) and Diary of a Victorian Colonial (2009). Mary Chiappe and Sam Benady have also published a series of detective books centred on the character of the nineteenth-century Gibraltarian sleuth Bresciano. Gibraltarian cuisine is the result of a long relationship between the Andalusian Spaniards and the British, as well as the many foreigners who made Gibraltar their home over the past three centuries. The culinary influences include those from Malta, Genoa, Portugal, Andalusia and Britain. This marriage of tastes has given Gibraltar an eclectic mix of Mediterranean and British cuisine. Profiteroles, a French choux pastry ball with a sweet filling of whipped cream, is considered to be Gibraltar's national dish. These are often served after a meal including Calentita, a baked bread-like dish made with chickpea flour, water, olive oil, salt and pepper. GB Airways operated a service between Gibraltar and London and other cities for many years. The airline initially flew under the name "Gibraltar Airways". In 1989, and in anticipation of service to cities outside the UK, Gibraltar Airways changed its name to GB Airways with the belief that a new name would incur fewer political problems. As a franchise, the airline operated flights in full British Airways livery. In 2007, GB Airways was purchased by easyJet,  which began operating flights under their name in April 2008 when British Airways re-introduced flights to Gibraltar under their name. EasyJet have since added Bristol and Manchester and also operated flights to Liverpool between 2011 and 2012. Until entering administration in October 2017, Monarch Airlines operated the largest number of flights between the United Kingdom and Gibraltar, with scheduled services between Gibraltar and Luton, London Gatwick, Birmingham and Manchester. The Spanish national airline, Iberia, operated a daily service to Madrid which ceased for lack of demand. In May 2009, Ándalus Líneas Aéreas opened a Spanish service,  which also ceased operations in March 2010. An annual return charter flight to Malta is operated by Maltese national airline, Air Malta. 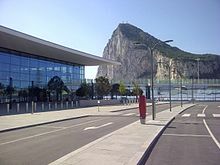 Gibraltar International Airport is unusual not only because of its proximity to the city centre resulting in the airport terminal being within walking distance of much of Gibraltar but also because the runway intersects Winston Churchill Avenue, the main north-south street, requiring movable barricades to close when aircraft land or depart. New roads and a tunnel, which will end the need to stop road traffic when aircraft use the runway, were planned to coincide with the building of a new airport terminal building with an originally estimated completion date of 2009,   although it has not been completed because of delays. While railway track extends to the outskirts of La Línea from an aborted rail expansion project in the 1970s,   the closest railway station in Spain is San Roque station, accessible via buses from La Línea. The Royal Gibraltar Regiment provides the army garrison with a detachment of the British Army, based at Devils Tower Camp. The regiment was originally a part-time reserve force until the British Army placed it on a permanent footing in 1990. The regiment includes full-time and part-time soldiers recruited from Gibraltar as well as British Army regulars posted from other regiments. The Royal Navy maintains a squadron at the Rock. The squadron is responsible for the security and integrity of British Gibraltar Territorial Waters (BGTW). The shore establishment at Gibraltar is called HMS Rooke after Sir George Rooke, who captured the Rock for Archduke Charles (pretender to the Spanish throne) in 1704. The naval air base was named HMS Cormorant. Gibraltar's strategic position provides an important facility for the Royal Navy and Britain's allies. British and US nuclear submarines frequently visit the Z berths at Gibraltar. A Z berth provides the facility for nuclear submarines to visit for operational or recreational purposes and for non-nuclear repairs. During the Falklands War, an Argentine plan to attack British shipping in the harbour using frogmen ( Operation Algeciras) was foiled. The naval base also played a part in supporting the task force sent by Britain to recover the Falklands. ^ The treaty was signed on 31 March 1713 Old Style or 11 April 1713 New Style ( Peace and Friendship Treaty of Utrecht between France and Great Britain). ^ Norris, H.T. (1961). 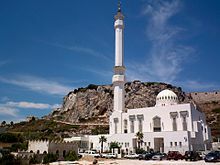 "The Early Islamic Settlement in Gibraltar". Journal of the Royal Anthropological Institute of Great Britain and Ireland. 91: 39–51. doi: 10.2307/2844467. JSTOR 2844467.